Conid Event : Antwerppen & More ! At this occasion three new Bukfiller versions will be revealed , and all earlier made prototypes will be shown to the public. You are most welcome, hope to meet you there ! If only I lived in Europe or the event was held in September while I was in France for a conference. Attached the Conid link showing some pictures taken at the occasion of this event. How about a Conid event in San Francisco? Thanks Francis, looks like a very interesting event. I enjoyed seeing your prototypes on display. The pale blue fish-scale prototype looks amazing. Maybe next year, will try to convince Werner ! Glad reading you enjoy your kingsize ! Attached a link to the "pencil case blog"on which you can see also more picture of my prototypes. Francis, I am the happy owner of a Regular bulkfiller bought at the LWES show a couple of years ago - hope to see you and the CONID team at the show again this year. I saw from the link to the blog you have done a collaboration with AP Limited Editions!?! 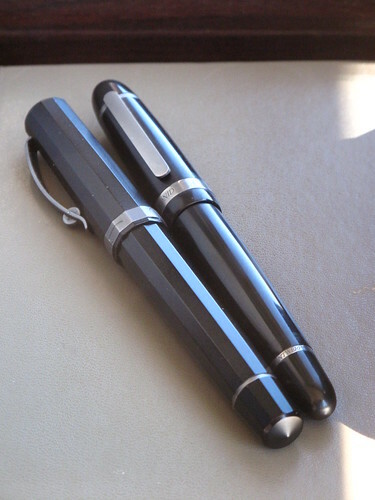 I cannot seem to find a complete picture of the whole pen - could you post a couple? Please note the basic pens Conid makes for AP are not equipped with the bulk filler, but with the "shifting O ring" plunjer filler system I've designed 15 years ago. Sorry to tell you that I have no pictures available..
Ok Francis, thanks. Hopefully I will get to see one at the LWES Show.